Striking MyFerryLink workers spark cross-Channel chaos after blockading Calais and Eurotunnel France. Plus, a hundred Brits have been jailed in France for people smuggling in private vans and cars says the BBC. Adventurer drives 8000km to the Himalayas. More unmarked ‘double tap’ camera cars to hit French roads. Key Dolomites road partly reopens after landslide ‘with great caution’. Major disruption to last until 19:00 (18:00BST) with knock-on delays to follow. Major disruption on the Channel this morning during MyFerryLink blockade. Drama on the French side of the Channel early this morning after MyFerryLink ships blockaded all port movements in Calais and striking workers blocked access to the Eurotunnel freight terminal. The Channel Tunnel operator also said this morning that migrants had attempted to breach its perimeter fence. Truck driver Chris Cary told us that as he drove to catch the train in France at 05:00 the protestors threw things in his way. ‘Volvo 1, French 0,’ he said. This all comes a day after Eurotunnel confirmed the sale of two MyFerryLink ships to rival Dover-Calais operator DFDS. A forthright statement from P&O chief executive Helen Deeble says, ‘While we have tremendous sympathy for the difficult situation of these employees who fear that their jobs will end on 2 July, in disrupting the operations of the whole of the port of Calais, Eurotunnel continues to operate and DFDS sails into Dunkerque. Early reports the strike would not finish before this evening were correct. 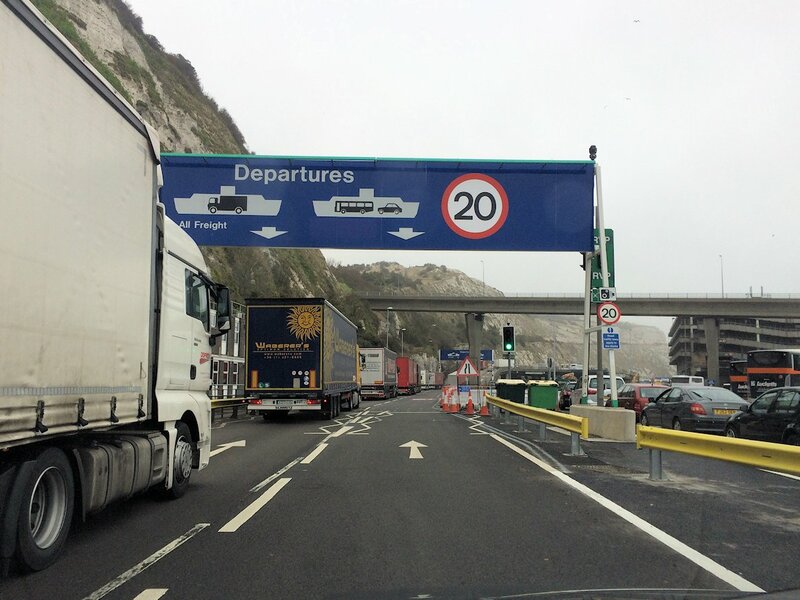 The first P&O ferry left Dover at 16:30BST with an arrival time of 18:00BST when the blockade is expected to be lifted. The first P&O service from Calais should leave at 19:30. The strike had seemed like it was starting to wind down mid-afternoon until protestors gained access to the Eurotunnel terminal in France and all services were suspended. @Eurostar said it was unable to run trains due a fire outside the tunnel lit by protestors. Eurotunnel says it hopes to resume services later this evening. Meanwhile, freight traffic built up around Dover, Eurotunnel, Calais and Dunkirk. Operation Stack for freight traffic has now been started on the M20 coastbound (and likely to remain in place overnight and into tomorrow). Car drivers are advised to follow the black circle on yellow background signs from J8, or head to Dover on the M2/A2. All drivers waiting in France are advised to be especially vigilant of migrants attempting to gain access to vehicles. Adventurer Mike Horn drove a Mercedes G-Glass 8000km from his home in Switzerland to northwest Pakistan to climb K2. The 8000km trip took him through Moscow, above. ‘Let’s just say it’s a challenging commute to work,’ he says. Read about the trip or watch the six part short film. roundup: CALAIS MIGRANT CRISIS. Indebted students and others desperate for money, including British nationals, are being targeted by people traffickers in Calais says the BBC’s File on 4 programme. Up to 100 Britons have been jailed in France this past year for attempting to smuggle migrants in private vans and cars. People from the UK make up a quarter of those brought before local courts on trafficking charges. ‘Ticket to Hide’ will be broadcast on Radio 4 tonight at 20:00 or available later on BBC iPlayer. FRANCE. A fresh crop of 61 Dacia Sandero Stepway soft roaders is to join the fleet of unmarked police camera cars, adding to the existing Peugeot 208 and 308s, Renault Megane and Citroen Kangoos reports autorouteinfo.fr. By the end of the year more than 300 in total will be on the roads. Campaign group 40 Million Automobilistes calls them ‘a weapon of repression and stealth deterrence’ but there’s no denying their effectiveness, at least psychologically. When the first batch was introduced in March 2013 accident deaths immediately fell by 30% though the effect soon wore off. The increasing chances of getting caught may help reverse the current slide in road safety stats – these new generation ‘double tap’ cars can photograph front and back, in any weather, and on main roads too. ITALY. The scenic SS51 Alemagna State Road which heads up to Cortina d’Ampezzo in the High Dolomites – epicentre of major mountain roads such as Pordoi, Giau, Campolungo, Falzarego and Valparola – partly reopened ‘with great caution’ tonight after a landslide cut the road at Acquabona in the late afternoon according to reports. No vehicles were involved, and no-one was injured, after a mud bank collapsed during the storms which have plagued the region in the last few days.